Check out Best Deal Magazines, online at BestDealMagazines.com, for the best deals in magazine subscriptions. Best Deal Magazines offers the nation's most popular consumer magazines at low prices, with full year subscriptions starting as low as $4.69! BestDealMagazines.com provides mags from a plethora of topics, including health and fitness magazines, entertainment magazines, outdoor activities, food and wine, cars and motorcycles, art magazines, and much more. Some titles available at Best Deal Magazines, include Yoga Journal, Family Fun, Better Homes and Gardens, Wine Enthusiast, Atlantic Monthly, Mother Jones, Autoweek, Car and Driver, and many more. BestDealMagazines.com provides shipping in the United States. But before you brush up on the topic of your choice, be sure to save with the latest BestDealMagazines.com discounts, Best Deal Magazines promotions, and Best Deal Magazines coupon codes found right here at RetailSteal.com. Use our coupon code online at Best Deal Magazines to enjoy 16% savings on merchandise. Shop at Best Deal Magazines and enjoy $5 savings on orders $30+. Click here for code. Shop at Best Deal Magazines and enjoy $15 savings on orders $70+. Click here for code. Shop at Best Deal Magazines and enjoy $10 savings on orders $50+. Click here for code. Go to BestDealMagazines.com to save up to 85% on popular magazine subscriptions, including Yoga Journal, Parents, Popular Mechanics, and many more. Click here to get your read on! Visit BestDealMagazines.com and get a free gift with every magazine subscription. Great magazines such as Journal, ShopSmart, Better Homes, and many more. Get a full year's magazine subscription at BestDealMagazines.com for as low as $4.69! Click here for unbeatable savings. Go to Best Deal Magazines for the free magazine of the week. Click here to check out this week's offer. 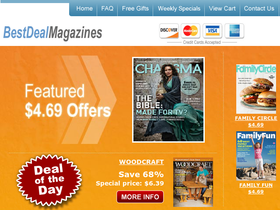 Receive $7.50 off your Best Deal Magazines purchase with this coupon code. Shop online and save today on orders of $40 or more. Use our coupon code at Best Deal Magazines online today to enjoy 30% savings on select magazine subscriptions including Boys' Life Magazine. Spend $49 or more at Alibris.com and you'll qualify for free super value shipping. Save money on school by buying your textbooks at Alibris.com where you can save up to 90% on a wide range of subjects. Find a wide variety of books on Alibris.com and take advantage of free shipping on select books. Use this coupon code at Alibris and save $1 on any order. Get your read on with a good book from Better World Books and take advantage of free shipping on every order. Shop for textbooks at BetterWorldBooks.com and you can save up to 90% on a wide variety of subjects. Check out the bargain bin at Better World Books and you'll find two great deals - 3 books for $10 or 4 books for $12. Subscribe to USA Today and you'll get home or office delivery for as low as $0.75 per day. Click link to save! When you subscribe to USA Today get 8 weeks of e-edition for only $9.95 which is 75% off newsstand price or $99 for a 52 week subscription. Subscribe to Sports Weekly - As low as $1/Issue. Subscribe to Sports Weekly with USA Today and you'll receive issues for as low as $1 each.